Everyone seeks the magic of the little brown rabbit, but what exactly is it? All the creatures in the forest have heard of Wazzyjump, the most mysterious creature who lives there. His magic is legendary, but no one seems able to describe it. Lion cannot stand the idea that any animal is more powerful than himself, and he vows to catch Wazzyjump and question him. Learning of this plan, the clever fox decides to search as well...for himself. He happens upon the sleeping rabbit, and the duo ends up laughing and playing all afternoon. The other animals get wind of this and decide to follow the fox the next day. At last, they will have their answer. When they find the rabbit and the fox, the lion tries to pounce on Wazzyjump, again and again, but the rabbit is too quick for him. The lion becomes frustrated beyond roaring, and the only thing that's left to do...is laugh! Soon everyone is the forest is laughing and playing together; and when the lion asks Wazzyjump to explain his magic, the quick little rabbit replies, "What magic?" Moniz's animals have a childlike quality and a soft focus that support his valuable message, which is presented with an admirably light touch. The visual transformation of both the lion and the fox from predator to playmate borders on...the magical. Wazzyjump is a rabbit with a special, secret magic. Everyone knows about Wazzyjump, but no one really understands what his magic does. When Lion hears of this mysterious animal, he decides that he wants Wazzyjump’s magic for himself, and he tells the other animals in the forest to help him find the creature. Because Fox doesn’t think Lion should get all of the special magic, he sets out to find Wazzyjump for his own purposes. But can Wazzyjump’s magic be stolen? These two selfish creatures are going to find out, and they might just get a taste of the curious rabbit’s power along the way. The characters in Wazzyjump, shown both through the text of the story as well as through the illustrations, are terrifically suited to this tale. Lion and Fox are misguided, though not altogether unlikeable characters; Lion is very regal (something beautifully highlighted by the illustrations), and Fox is clever and perseveres in his search for the rabbit even after everyone else has given up. Bear, a secondary character in the story, is lovably lazy, and the various birds and other woodland creatures are sometimes visually striking, and at other times are adorably drawn. 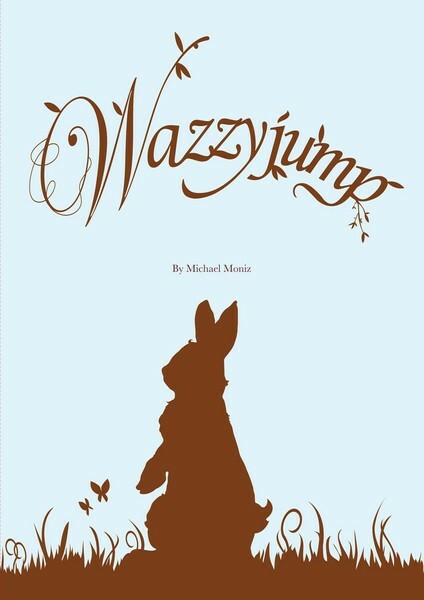 Wazzyjump, too, is very interesting, since, even though he is the title character of the story, he is an intriguingly mysterious rabbit. He does not have any active thoughts or words in the story, and ultimately it is left up to the reader to determine exactly what the nature of his magic actually is, adding an extra element of fun for the reader. Michael Moniz is primarily a painter, and it is the illustrations in Wazzyjump that really shine. The images in this story are done with a hazy look to them. This, coupled with the use of gentle colours, like soft yellow and pastel blue, make the illustrations cheerful and bright, a tone that fits perfectly with the story being told. There is a lot of movement in these images as well. Birds, butterflies, and other wispy objects give every page of this book a great sense of movement, and the animals, themselves, are painted with curves and wisps that mimic fur swaying in a breeze. These images also have an overarching innocence to them; the light colours, joyful images, and even the use of small, black dots for the animals’ eyes make the illustrations more accessible to a younger audience since the text, itself, may be of greater interest to a slightly older group. Michael Moniz’s Wazzyjump is a delightful tale of mystery, discovery, and friendship. The story of Wazzyjump and his woodland friends is cute and charming. The illustrations are full of happy innocence, and they really highlight the talents of Moniz and his passion for painting. The wonder of Wazzyjump is present in each page of this tale, and it will be a great read for those looking for a good story told in a classically magical way. The first book by Toronto artist Michael Moniz features illustrations with considerable appeal, both for their soft, luminous colours and for the delicacy with which they convey a sense of lively movement. The sunshine that bathes the pictures, the rabbit silhouettes on every page and on the endpapers, and the leafy scrollwork decorating some of the pictures and letters all give the book an old-fashioned charm. Though the art is the main attraction here, Moniz’s story has a satisfying inevitability, and his text, for the most part, reads aloud quite well. This is a gentle and appealing book, one with a clear message about the power of having fun. In a far-off forest there lives a little rabbit named Wazzyjump, who has magical powers. No one understand just exactly what his magical powers are, but he is rumoured to be able to leap and move in ways that no normal bunny should be. All of the animals of the forest want to find Wazzyjump and discover his secret. Some, like sly fox, in order to steal the powers for themselves. Some, like bear, just to see what all the fuss is about. Wazzyjump goes about his cheerful, friendly life. It's pleasing to see how Wazzyjump uses his "magic" to win over each new friend. In a wooded forest a long, long time ago, lived a sweet magical rabbit named Wazzyjump. Wazzyjump is misunderstood, as the other forest creatures recognize him as a mysterious being but cannot figure out just what his magic is. Lion in particular, is quite distraught, as he is determined to be the most special creature in the forest. He decides to capture the magical rabbit to steal his magic for himself. He enlists the other creatures to help him track down Wazzyjump, but to no avail. Finally, sly Fox decides to pick up the search himself to his own benefit. He, too, figures that he should have Wazzyjump’s magic, and being the clever creature he is, manages to locate the rabbit. However, Wazzyjump has a mischievous streak as well, and giggles at the Fox as he tries to capture him, thinking it is a pretty funny game. It doesn’t take long for Fox to take part in the fun, and the two “enemies” end up making a game of the hunt. They play all that afternoon and again and again in the days to come. Over the next few days, other creatures join in the fun, including Bear, Raccoon and Jay. Word eventually gets back to Lion, and when he reaches the group he is enraged with jealous, thinking that they have stolen Wazzyjump’s magic from behind his back. It’s only a matter of time, however, until even Lion cannot control his mirth and joins in on the fun. Moniz has created a delightful folktale in Wazzyjump. His charming watercolor paintings are enchanting and complement the warm feeling of the story perfectly. The liveliness of the playful animals is conveyed in the paintings as well, and the delicate scrollwork in both the letter and the paintings add to the old-fashioned appeal of the story. Wazzyjump would be a beautiful addition to any folktale collections.